The delicious olie bollen is a wonderful snack preparation that can be enjoyed both as a dessert and a snack. Top a generous serving of these yummy fluffed up balls with a huge scoop of creamy toppings such as whipped cream or creamy ice cream and drizzle some thick sauce of your choice to have a soul healing food experience. 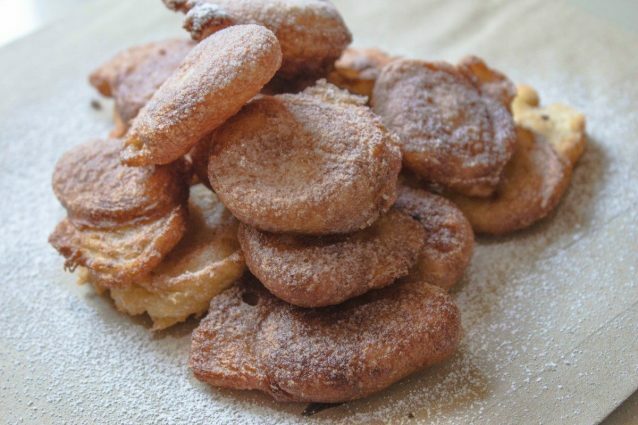 If you are too lazy to create an over the top version of olie bollen then a humble drizzle of icing sugar and cinnamon powder can also uplift your mood in no time. The best part of the recipe is you do not even have to assemble a very exotic ingredient line up and some of the basic kitchen essentials will do the needful! So, try this yummy goodness that is all pleasure and hardly ay work! In a small bowl add ½ teaspoon sugar and luke warm water. Stir both the ingredients a little. Add the dry yeast to sugar and water solution, do not stir it. Let the yeast granules soak in the sugar solution for about 5 minutes and then stir it all together until the yeast mixture is smooth and no lumps are present in the bowl. In another bowl, add the flour, sugar and mix the ingredients roughly using a fork or a spoon. Pour the diluted yeast mixture in to the flour, followed by egg, milk and then gradually stir the ingredients together. Whisk the batter nicely until the ingredients are well combined and the batter is smooth in consistency. Keep the batter aside in a warm place for about 10 to 15 minutes or until the batter rises to almost double the original volume. Add salt to the batter and give everything a slight whisk. Heat oil in a pan and add a dollop of the olie bollen batter carefully in the hot oil. Repeat the process and add more ladleful of batter at a distance of about two inches from one another. Fry the olie bollen until golden brown in color. Flip it and fry the other side also to golden brown color. Transfer the puffed up fried balls to another bowl. Repeat the process with the remaining batter. Dust the piping hot olie bollen with icing sugar and enjoy! Crack open the egg very carefully in to the bowl so that no piece of shell is added to the bowl. If you are not too sure of breaking it open perfectly then you may consider breaking the egg open in to another bowl first and then transferring it in to the flour mix.